MADISON - Welcome to the weekly installment of my chair update! I really enjoyed seeing people at the Eau Claire and Richland County spring flings this week. The excitement about the election: Russ, our far superior Democratic Presidential candidates, the real possibility of picking up a congressional seat and talented, committed State Legislature candidates is great to see. 2016 is going to be our year and it is great to see the excitement and commitment to working for the ticket growing. On Tuesday, Donald Trump successfully completed his hostile takeover of the Republican Party by winning the Indiana primary, which forced out his two main rivals and all but secured the Republican Presidential nomination. Donald Trump's dangerous, sexist, racist, and xenophobic rhetoric didn't stop Republican leaders in Wisconsin from eagerly jumping on board the Trump train. 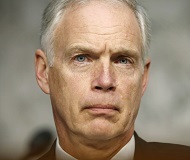 I am truly disappointed and appalled by Sen. Ron Johnson, Gov. Scott Walker, Senate Majority Leader Scott Fitzgerald, Rep. Kathy Bernier and the WisGOP 3rd Congressional District Chair who all gleefully hug Trump and his heinous views. Even Speaker Paul Ryan, the highest ranking elected leader in the Republican Party, can't bring himself to denounce dangerous Donald Trump's pursuit of the Presidency and said he hopes and wants to support Donald Trump. Any responsible leader can see that Donald Trump is dangerous and lacks both the judgment and the temperament to be president. Anything short of denouncing Trump's candidacy is an endorsement of his racist, sexist, and xenophobic views and Republicans in Wisconsin should rip up their tickets for the Trump Train. Thankfully, we have two outstanding Democratic candidates for President who will continue to treat the office with the respect we all know the position deserves. Democrats will be united and hold Donald Trump accountable every day until November 8th. In America, we have a simple promise: if you work hard, play by the rules, and pay your fair share you should be able to retire with dignity. Social Security and Medicare embody this promise, so in the Month of May, which is dedicated to Older Americans, we must remember how important these programs are to millions and reaffirm our commitment to defending them at all costs. Millionaires and billionaires like Ron Johnson and his new pal Donald Trump don't need these programs so they don't understand how indispensable they are. But right here in our own state, 30% of Wisconsinites receive all of their monthly income from Social Security benefits and millions more benefit from the guaranteed healthcare of Medicare. They are foundational to working-class and middle-class economic security. Let this month serve as a reminder of the need to protect Older Americans from Republican attempts to try and loot these programs to give more tax breaks to the wealthy. Democrats will continue to protect them at all costs just as we have from the very beginning and will fight to strengthen them so America can better live up to its promise long into the future. Click here to listen to the DPW's new ad about the threat Ron Johnson poses to these vital programs. I saw Tammy zig-zagging across Wisconsin this week talking about a host of issues. She hosted a round table in La Crosse discussing the opioid epidemic facing our state and country. She also made her way to River Falls to discuss her In the Red legislation that works to alleviate the burden of student debt. In addition, she went to Menomonie, Racine, Kenosha, and Milwaukee. Along the way she joined with other Wisconsin lawmakers to call on the Justice Department to review Voter ID law in Wisconsin. Wisconsinites are confused why Ron Johnson announced his re-election campaign this week because of how apparent it is that he hates doing his job. Whether it is missing 60% of his Homeland Security Committee hearings or refusing to meet with President Obama’s Supreme Court nominee, Ron Johnson can’t be bothered to put the work in. We have to make sure Russ gets elected because we know he will represent our best interests and work tirelessly to make a better Wisconsin. As we near Mother's Day, it is important to recognize and be grateful for the sacrifice, patience, and dedication of so many mothers all over the state. This is why Democrats work tirelessly to better the lives of single and working mothers around our country. We are fighting to accomplish equal pay for equal work so mothers and their families are not short-changed of thousands of dollars that otherwise could go towards groceries, school supplies or college tuition. As a mother of two daughters, I am outraged by the thought of them being forced to raise families on less simply due to their gender. In addition, we need to recognize the importance of a mother having time to welcome a new born and pass paid family leave so mothers never have to face the decision between going to work, like elected office, and taking care of a new born baby Having a child is a great gift that has challenges and our community can ensure all families have the time to welcome and adjust to their new addition so all thrive. Finally, we will continue to stand up for Planned Parenthood because we believe mothers deserve access to quality and affordable healthcare. This Mother's Day, as we appreciate our mothers' dedication to us, let's rededicate our efforts to fighting for them on these issues. Click here to listen to the newest Democratic weekly address on Mother's Day and Women's National Health Week. This week we celebrated National Teacher Appreciation Day, President Obama recognized his 5th grade teacher and as I read his post it made me think of so many great teachers that my children and I had. “The first time she called on me, I wished she hadn't. In fact, I wished I were just about anywhere else but at that desk, in that room of children staring at me. But over the course of that year, Ms. Hefty taught me that I had something to say -- not in spite of my differences, but because of them. She made every single student in that class feel special,” Obama wrote. "She reinforced that essential value of empathy that my mother and my grandparents had taught me. That is something that I carry with me every day as President. This is the simple and undeniable power of a good teacher," the president continued. Teachers touch all of our lives. They make us see the possibilities ahead of us, they make us reach for our potential and sometimes they help us find potential we never knew we had. Great teachers make our communities stronger because they help ALL the children. They ensure that even when a child doesn’t have the support they need at home they get a chance to succeed. That’s why it is so important that we as a society support them in their work. Governor Walker’s disastrous budget cuts don’t ensure teachers get the support they need to do the important work of helping all our citizens reach their potential. Under Walker and Republicans in the legislature, over $800 million has been stripped away from our public schools, and another $250 million was slashed from our UW system. The cuts are much larger than that too since the legislature approved funding that should go to our public schools to go to private schools Our teachers are doing everything they can, but these cuts prevent them from doing what our kids deserve. They also are discouraging young people with the gift of teaching to go into the profession. So, thank a teacher, and back that up with action. Contact your legislator and the governor and tell them that our teachers and students deserve to be a priority once again. We are so excited for our upcoming state convention on June 3rd and 4th in Green Bay. For this event to run as smoothly as possible we need your help, so please sign up for a volunteer shift here. This is going to be a great event that you are not going to want to miss. Sign up so you can see all the action click here! I have continued my travels across the state and I keep hearing over and over how people want to get involved! People want to write letters to the editors, call into radio stations, and be a local voice for the Democratic Party but don’t feel they have the messaging to properly have their voice heard. Luckily, we launched three different messaging services that I am getting great feed back on and I think would be helpful for all of you who want to get involved in really helping our candidate around the state. Below you can find links and descriptions for our three services, and I encourage you all to sign up if you haven’t already. Also, please feel free to forward these sign-up links to your strong Democratic allies! Message Monday: we will send you what is driving the week and materials like talking points, social media posts, and sample letters to the editor. To sign up for the Message Monday Team click here. Grassroots Response: a mid-week update on what we expect the rest of the week to look like and more materials for circulation. To sign up for the Grassroots Response Team click here. Tweeters Team: consists of promoting our Party’s tweets and tweets you can put out yourself based on what content is driving the day. To sign up for the WisDems Tweeters Team click here. MADISON - “I am going to certainly endorse the Republican nominee, and obviously it looks like that will be Mr. Trump…[we’re] going to make this country great again,” Senator Ron Johnson. With the path cleared for Donald Trump to become the Republican presidential nominee, U.S. Sen. Ron Johnson says he won’t hesitate supporting the reality TV star and real estate mogul. “I am going to certainly endorse the Republican nominee, and obviously it looks like that will be Mr. Trump,” Johnson, R-Wis., said Wednesday in Eau Claire. Trump became the de facto nominee Tuesday after a decisive primary win in Indiana that prompted the last two rivals from a field that once totaled 17 Republicans to drop out of the race. Texas Sen. Ted Cruz, who decisively won the Wisconsin GOP primary just four weeks earlier, announced the suspension of his bidTuesday night, and multiple media reports indicate Ohio Gov. John Kasich will follow suit Wednesday evening. Some healing may be necessary among Republicans after a highly divisive campaign, but Johnson said he believes Republicans will be able to unite behind Trump because of their strong dislike of Democratic front-runner Hillary Clinton. “I think when Americans really start looking at who Hillary Clinton is and her dereliction of duty, the corruption, all the baggage she brings to her candidacy — she has more baggage than an airport claim area — it’s going to be an election of contrasts, (Clinton) vs. our nominee who again comes from the private sector and actually understands how harmful government is,” Johnson said before a business roundtable event at the Eau Claire Area Chamber of Commerce that was part of his statewide tour formally announcing his re-election bid. The Wisconsin Democratic Party was quick to pounce on Johnson’s support for Trump, calling attention to some of the presumptive GOP nominee’s controversial stands. Johnson said Trump’s emergence is a product of Americans’ anger with the status quo and desire to be led by someone who is not a career politician. “I think the story of this election cycle is the American people have wised up to the professional political class, how utterly failed the government is and how the professional career politicians have failed the American public,” Johnson said. He equated Trump with “disruptive technology” that disrupts markets in sometimes unexpected ways. MADISON - “Ron Johnson plans to 'reintroduce' himself to the voters of Wisconsin, but he can’t run from who he really is - an ultra-conservative Washington Republican who is more interested in taking orders from Mitch McConnell than listening to middle class and working Wisconsin families. And with a long record to prove it.” Harry Hartfield, Spokesman for the Democratic Party of Wisconsin. Don’t take our word for it. Below, in his own words, Sen. Johnson proves just how out of touch he is with the people of Wisconsin. 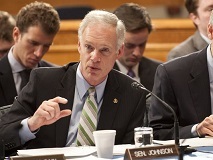 You can learn more about Johnson’s record at ronjohnson.org. Johnson called Social Security "a Ponzi Scheme" and believes it's "a shame" that George W. Bush didn't privatize the program immediately before the economic collapse of 2008. Johnson not only opposes efforts to allow students to refinance their loans, but he also completely objects to federal student loans that help young people afford higher education. He thinks federal student loans are "free money." Johnson's only plan to combat ISIS is another American-led ground invasion in the Middle East of "25,000 [American] troops, a total coalition of 100,000" – advice he must have received from campaign contributor Donald Rumsfeld. Johnson called his vote to defund Planned Parenthood a "fun" vote and railed against equal pay legislation as doing "more harm than good." He voted against equal pay legislation five times, claiming it could "cause workplace conflict."